Lost and Found Soles is a depiction of how place holds our lives in the most mundane and personal ways. Old shoes desiccated by the sun and half eaten by the desert are ubiquitous objects of debris in the Santa Fe landscape. Once a person's intimate belonging and item of physical protection, their presence and condition is unsettling and is a reminder of our fragility and the uncertainties in life. While working on a different project with the shoes, I wondered more and more about the people who wore them, how many people wore them and the varied circumstances of all our lives. 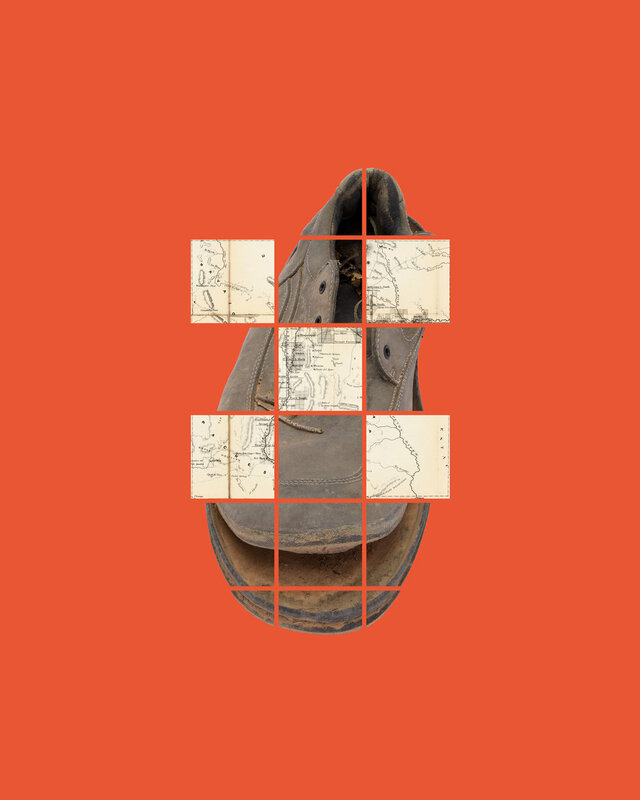 Combining photographs of the old shoes with historic maps of the Santa Fe region creates a contextual relationship to this place we both inhabit and emphasizes the intersections of art and archaeology, of pattern and place, of connection and perceived distance. This combination underscores for me our connections to each other despite our social distance.